Disaster. Today I forgot to take my camera so I have no photo. I chose a salad today but I don't think it's fair to rate it if you can't see it for yourselves. I got a lovely email reply about where our meat comes from though and with it came loads of info about the hot dogs we have. I read it with Dad but it's hard to understand. It's weird that they can be kept for three years though! Let me know what you think. 'I'm a student at a university and we have a few canteens for many students. "Schupfnudeln". I like them a lot! You can always take three side dishes(always different ones). food-o-meter. I couldn't eat all the rice because it was very dry without sauce. I like all the choices you get at University but it would take me a long time to decide everyday! The Schupfnudeln look like gnocchi which are delicious. I'd really like to see some more school dinners from the UK to compare to mine so please email neverseconds@gmail.com with a photo or just an email if you are not allowed a camera. I will remember my camera next week. I will. I'm very glad to see that they are using lower-fat and salt hot dogs, Veg. I've actually never heard of tinned hot dogs before, but I can see why they would be a better option for schools (who need large quantities). It would take up a LOT of freezer space otherwise. They didn't answer your question about where the meat comes from. All you know is that it's heavily processed with preservatives, starches, and flavors. Where did the pigs and chickens live? What were their living conditions? What did they eat? If you really want to know...which I''m sure if you really think about it, you really don't, watch the movie "Food Inc." Fair warning though, it's not for people with weak stomachs. 'Reduced salt and fat pork and chicken hot dogs' in a tin? when does your school year end? Mine already has, and I am looking foreward to reading more of your bloggery. It's good that they send you that information. It's interesting to see that the hot dogs are made of about half meat and half other stuff. That's actually better than I thought they might have been. We just had 2 days off school because of snow! Ohh... Can I link to my healthy-food blog (prazeresorganicos.blogspot.com)? Great blog - wish I could have written as well at nine! Glad I don't have to eat those hotdogs - they look vile - and it's a pretty safe bet that both pigs and chickens were battery animals at the end of their useful lives. Canned food, by the way, can keep for many years, as the canning process sterilises the contents. In (I think), the sixties, canned food was found in Captain Scott's camp, in Antarctica, that was still in perfect condition (as it's already sterile, freezing has no effect on canned food, though it might burst soup cans as liquids expand when frozen). I see nothing that says the pork or chicken were sourced in Scotland and, anyway, Westler Foods is a Yorkshire company - the meat could be from anywhere in the world. Scotland might have banned the keeping of battery chickens, and rightly so, but it would have a hard time banning the resulting meat from elsewhere in the UK or anywhere else - it's hard to avoid - one reason I never buy chicken unless it's a whole bird of known provenance, if possible, or free-range/organic at the very least. Almost forgot, Veg - beware - my blog can be a bit sweary (disability rights and politics tend to make me angry)! Maybe get your Dad to check it first? As a lunch lady myself, I can tell you that NO ONE gets a hair in your food on purpose. Most try very hard not to do so and would be appalled if they knew they had not been successful. Have you suggested a student board to rate and help planned lunches at your school? 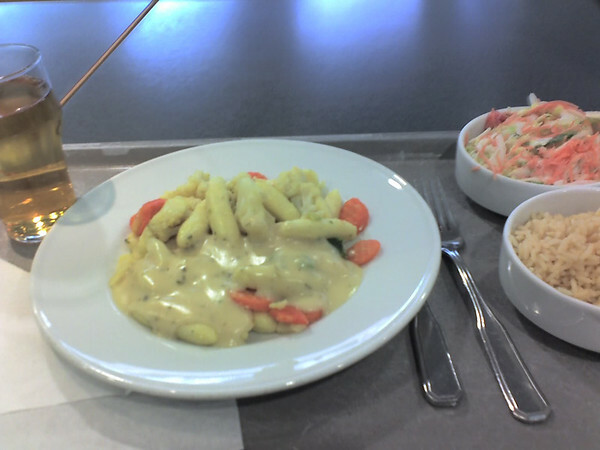 I don't like the Schupfnudeln that much, but food in the canteens in Münster is often very good. Good stuff from a nine year old. And I can remember when a school meal's was increased to five pence a day. That's is less than two pence today. if you want to cook Schupfnudeln by yourself, her is a recipe (i hope, i translated everything correct). it's very easy and done in 20 minutes. cook the potatoes in saltwater. make a potatomash and add yolk, flour and nutmeg. give a testpiece in boiling water and add some more flour, if your dough seperates. Roll out the dough on a floured workplate and cut fingerbig pieces. Form them into "Gnocchilike" formes and cook in boiling water. Drain and brown them in butter. Pieces of hair - 0 hilarious! Bravo young lady! Big up the bloggers! I would be more concerned about how the animals die than how they live. Although battery farming has now been eliminated in the UK, the barbaric practice of Halal slaughter is preferred by school meal providers because it's cheaper. I put an article on my blog about you love it ! Hope you don't mind if you do let me know and I take it off ! Welcome back Martha, I'd been looking forward to your latest blog post all day - well done. Really great job you are doing to the needy children. Wonderful. I wish that I love to request you please kindly include Indian children alson in your heart. You know many children in India also not having enoungh food and education. Please if at all possible kinldy share this project in your blog. All the best for your kind blessed wishes. Thank you! this is wonderful job by martha payne i love your all post and exited to see what's your upcoming post and what you explain about your school canteen food and pics. I really really excited to see your old posts. First, I think what you're doing with this blog is really interesting. You have gotten a lot of people to think about what kinds of food are being served to students all over the world. Second, as someone born & raised in Chicago, which was the USA's meat-packing capital for many years, I'm faintly alarmed at the idea of a canned hot dog, but Chicago is known for its very elaborate hot dogs. The sausage itself is made only of beef, & it's often either a kosher or kosher-style sausage. We then pile on mustard, onions, relish, tomatoes, small hot peppers, a slice of a dill pickle, and a dash of celery salt!